I drilled and tapped the column that the turn signal slide over and used a long set-screw to hold it in place. Works fine. Yes, I had forgotten about this mod. I did the same thing. I think a lot of us "borrowed" Paul's idea. Id say its time for an update there Bobby. How else are we supposed to know what part we need to push you to finish. I was thinking the same thing: In fact I just got back from Mastercraft Bodyworks, Erik is going to pick up the cobra on Tuesday and do all the panel alignment and trim - hood, doors, trunk - then bring it back and we'll pull the body off so I can continue the plumbing and wiring and get this motor fired this summer. I have a backlog of pictures to go through as well, i'll try to get some updates posted this weekend. Keeping with the period-correct originality look, the radiator I ordered from Hurricane has the inlet on the driver side, the outlet on the passenger side. But with the radiator angled back as it is, the inlet/outlet tubes don't line up well. See here the top inlet is pointed down, and away from the expansion tank above it. The lower outlet tube is directed right at the steering rack, making it difficult to connect a hose and to get around the large fan shroud I am using. I took the radiator to MC Auto Creations in Ferris, Texas - http://www.mcautocreations.com/ - where Aaron Chovanetz and his guys are wizards with aluminum; I wouldnt trust it with anyone else. They created new 1.75" O.D. aluminum tubes including a roller bead, and TIG welded them to the angle and direction I specified. They did a superb job, just to my specifications. I purchased the much-desired Ford Taurus 3.8L 2-speed fan from Ebay, which also has a huge shroud that covers most of the radiator surface area. I think the two speeds are 35 amp and 50 amp (!) draw. A few Hurricane owners have this fan, and swear by it in the Texas heat. I trimmed it just enough to sit flush, used some foam weatherstrip to seal and insulate against the fragile radiator fins, and mounted it to the radiator. I had to mount it as high as possible on the radiator in order for the lower part of the shroud to clear the steering rack. For the upper radiator hose, I could not find a stainless mandel bent tube that I wanted with a center-line radius larger than 3". The 3" radius just didnt "look" right to me. I have pictures of our local original cobra, CSX3020, pictures of Kirkhams and ERAs and they had the tube I was looking for. I emailed Kirkham and they wanted big $$$$ for theirs. I called Peter at ERA, and they have batches made to their specifications, and he was glad to sell me one at a very reasonable price. It has bead rolled at each end and and is already ceramic coated silver. Looking good. Lots of nice custom mods. So, one of the mods I wanted to do before ceramic coating the exhaust was to replace the mufflers supplied by Hurricane (via Cobra Valley, I think), with Cobrapack mufflers from Classic Chambered Exhaust, Inc. 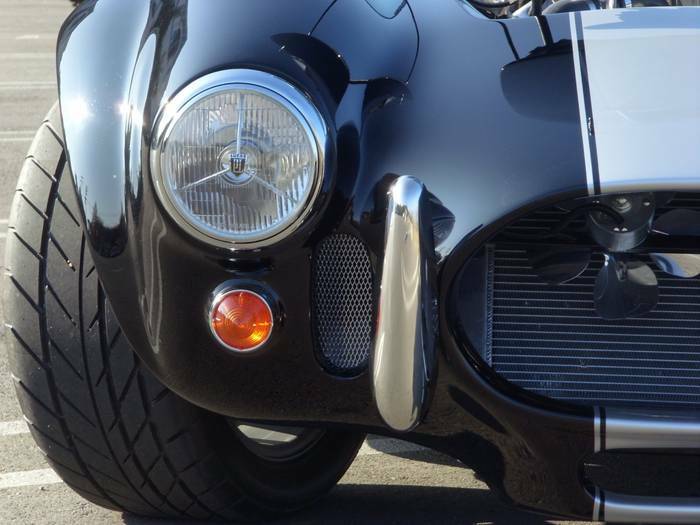 The first reason is the stock exhausts are more restrictive, and the Cobrapack mufflers from Classic Chambered have 3” OD Flowpath on the inside with 4" OD smooth body. The second reason is to eliminate future problems with rattling inside the muffler due to the spot weld in the stock units breaking loose. This happens eventually with every stock exhaust. The Classic Chambered mufflers fixes this problem before it happens. Considering my KC 427W will put out 600 hp, Eric at Classic Chambered recommended 3" OD packed mufflers, in 24" length. The stock muffler is 20" so I'll have to take some length out on the front and back ends. Eric also recommended using their funnel cones to help with a smooth flow of air from the 3.5" collector into the 3" muffler. So the first step was to take my side pipes to my friend Rick Bickle's shop where he has a really nice band saw, to make a nice clean, square cut. After mocking up everything on the car and measuring lengths, I trimmed town the ends of the Cobrapack muffler and its ready to weld in the funnel cone. Up next: TIG welding it all together, and ceramic coating! After spot welding, I took the side pipes to the metal experts at MC Auto Creations in Ferris, Texas where Aaron TIG welded the seams and ground them nice and smooth. Back from Crosslink Powder Coat and the look even better than I expected! Thanks for the detailed build posts. Your planning and workmanship on those pipes is outstanding. Beautiful looking pipes! I just hope you don't regret an 15* downturn on the turn outs. Too much downturn and you've got the leaf blower effect and anyone parking next to you on dirt will hate you! But really nice and thanks for the detailed post. It will go just fine. If the engine builder used your distibutor for the dyno run you should be good on the timing. Turn the ignition switch to RUN to let the fuel pump bring up pressure and look for any leaks. Adjust the fuel pressure regulator to specified setting for your EFI. Should pop right off with that EFI. It's going to be a significant emotional experience you will never forget. I'll be pulling for you on the 8th. Bob, I'm sure it will go fine. My engine builder was a friend of mine so he came over to help me with the startup. Have somebody take pics or video it would be even better. Good luck! I have mechanical fuel pump and carb - no EFI. I do have some steps from the engine builder to follow - filling with oil: one qt in the filter, 7 in the engine. I have an oil pump primer to run through the distributor hole. Fill the float bowls with gas through the vent tubes. May take a couple of starts to get the fuel pump to pick up.